Blue Origin's New Shepard booster aces its landing on Dec. 12, 2017. Update for April 29: Blue Origin's New Shepard 2.0 launch test is now expected to launch at 12:43 p.m. EDT (1643 GMT) after a slight delay due to thunderstorms at the West Texas launch site. You can watch live here or at BlueOrigin.com. Blue Origin plans to launch its first space mission of the year this weekend. Jeff Bezos' spaceflight company will perform another uncrewed flight of its New Shepard suborbital vehicle on Sunday (April 29) from Blue Origin's West Texas test site, the billionaire entrepreneur announced today (April 27). New Shepard is a rocket-capsule combo that Blue Origin is developing to fly passengers and scientific experiments to suborbital space and back. Both elements are reusable. The capsule lands with the aid of parachutes, and the booster comes down to Earth for a vertical touchdown, using engine firings to slow its descent, as SpaceX's Falcon 9 rockets do during orbital flights. As Bezos noted, New Shepard already has seven test flights under its belt. The most recent one came in December with the debut flight of "Version 2.0" of the crew capsule, which features extra-large windows. All of these missions have been uncrewed to date (though the December 2017 flight did feature an instrument-laden dummy dubbed Mannequin Skywalker). 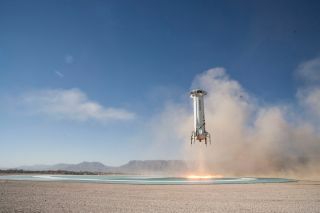 If testing continues to go well, New Shepard could start flying people as soon as this year, company representatives have said. Blue Origin's ambitions extend far beyond suborbital space. The company is also developing a heavy-lift orbital rocket called New Glenn whose first flight is targeted for 2020, and its longer-term plans include a mysterious vehicle called New Armstrong, which Bezos has mentioned but not elaborated upon. Like SpaceX, Blue Origin's horizon goal involves helping to make humanity a truly spacefaring civilization. Bezos has said repeatedly that, over the long haul, the company aims to help get millions of people living and working in space.